Henry Gough was an important Wolverhampton draper who died and left a will dated 1655. He was the oldest son and heir of John Gough, a wealthy merchant engaged in the Wolverhampton cloth trade. The family, it is believed, had originally come from London. A baptism record for a Henry son of John Gough is recorded in the register of St Peter’s Wolverhampton on 29 Dec 1561. However, this baptism is very early and would make him a man of 94 when he died. It is widely recorded elsewhere though that when his father married Elizabeth Blount of Ridware in St Peter’s on 8 May 1565 this was John Gough’s second marriage. The name of Henry’s mother is different and omitted. The baptism of his brother or half brother Richard is recorded in St Peter’s as 15 Sep 1569. Moreover, it was not until after his father’s death, buried 3 Mar 1596/7 that, we know, Henry first married. His wife was Elizabeth Leigh and the couple went on to have two surviving sons and four daughters. A document in the National Archives dated 1599-1600 describes a marriage settlement with John Leigh, Elizabeth’s father. There is no Parish Register Record of the marriage. Henry would have been 39 years of age if the baptism is good and he went on to marry twice again. The will of his father, John Gough is significant. It gives a long list of properties and land that he already owned and divided them between his two sons Henry and Richard, in that order. Henry’s sisters Elizabeth and Isabel, both at this point in time unmarried received cash bequests. His other sisters were Joan Cowper, Ann Jackson and Amy Tonkes. Henry and Richard are appointed executors with Henry Blankney and Richard Jackson, a son-in-law, as overseers. Henry acquired Old Fallings Hall in 1609 and clearly continued to amass a large fortune. His father-in-law died in 1609 and Henry was made the sole executor, his wife being the only child and main heir of her father’s estate. His brother Richard Gough, clerk of the Worshipful Company of Grocers, died in London in the same year, all adding to the accumulation of wealth. His eldest son was John Gough (bap 29 May 1608) who inherited Old Fallings. Henry’s grandson Sir Henry Gough (bap 3 Jan 1649) went on to purchase Perry Hall that became the new seat for the future generations. John Gough’s daughter Mary (bap 27 Sep 1636) married John Huntbach (m 21 Oct 1658) and was a direct ancestor of Sir Samuel Hellier. His other daughter Elizabeth (bap 25 Aug 1633) married Edward Wodehouse, the then owner of the Wodehouse, Wombourne. His other son Richard (bap 1 Jun 1613) was killed at the siege of Aston Hall in Dec 1643 – presumably with the Royalist forces defending it from the besieging Parliamentary troops. 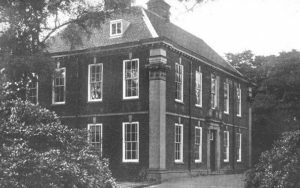 His daughter Elizabeth (bap 6 Dec 1604) married Lancelot Lee and was the direct ancestor of the Shaw-Hellier’s who eventually inherited Sir Samuel Hellier’s estates in 1784, which included the Wodehouse Wombourne. His daughter Ann (bap 15 Jan 1617) died a spinster and left a will that is the most comprehensive list of several dozen relations, near and close. This confirms a lot of the information written here as well as those described under Lancelot Lee. His daughter Isabel (bap 16 Sep 1620) married John Hamond, (m 20 Apr 1641) the executor of her sister Anne’s will in 1673. His daughter Judith married Richard Smallbrook (m 16 Jan 1649 Tettenhall), a mercer from Birmingham and member of the Smallbroke family. The marriage produced no children and Richard is recorded as remarrying in 1657. Note: “Madam St Andrew” is Elizabeth St Andrew (will probate 4 Dec 1650 PCC) nee Wedgwood, the third wife of William St Andrew of Gotham Notts. She was the cousin of Henry Gough’s daughter in law, Margaret Gough (nee Wedgwood), first wife of Henry’s son and heir John Gough.